First of all, my apologies that we kind of skipped over July 4th this year. It’s not that I lack love for los Estados Unidos, it’s just that I’ve been dealing with a Mexican-inspired morass. To be specific…. If anybody out there was paying attention, last week I wound up making a carefully constructed Margarita from the Hornitos people using the wrong type of tequila. Today, I am making amends with a drink where I actually used the right type of (very good) booze. What a shocker that this drink turned out to be more than okay, but actually very good. Combine all the ingredients in a cocktail shaker. Muddle the watermelon, jalapeno, and cilantro into the melange of liquids with a fair amount of gusto. Next, add lots of ice and shake as vigorously as you can manage — you shaker will be good and full of stuff, especially if you make two at once like I did at one point. Strain into a chilled rocks/old fashioned glass with ice cubes in it. 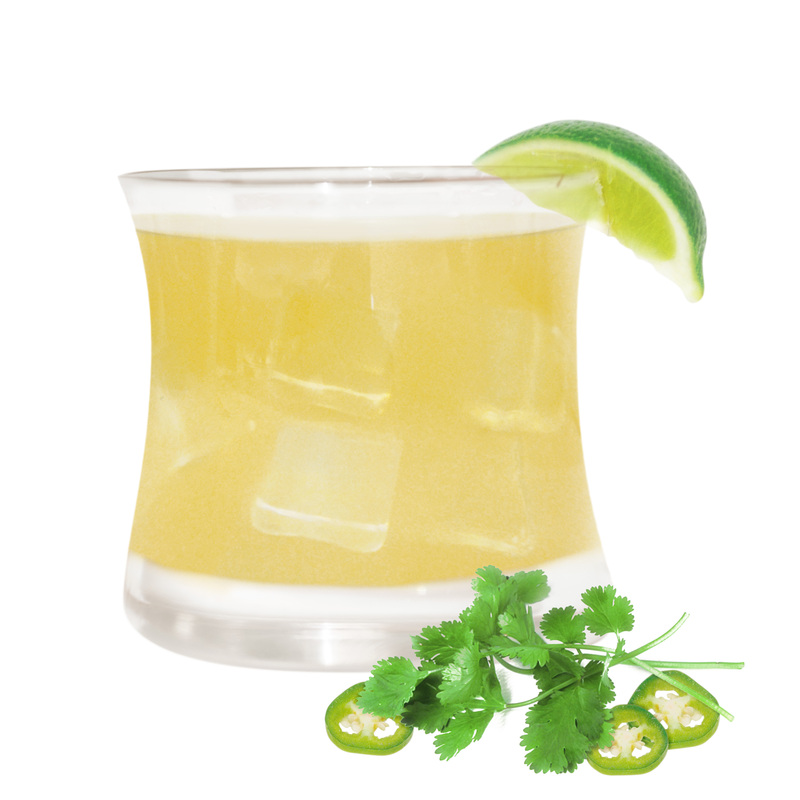 If you don’t want your drink overly hot from the jalapeno, you probably want to double strain it — i.e., pour from your cocktail shaker’s strain into a regular food strainer. On the other hand, if you don’t mind a drink that’s a bit muy on the caliente side, than just one regular cocktail strainer should be enough. Add the lime slice garnish, and toast, if you like, Hussong’s Cantina in beautiful Ensenada, Mexico. That’s where legend tells us the first Margarita was born. As with last week’s drink, the Seize Your Margarita is actually intended to be made with the new (to me, anyway) John DeKuyper & Sons O3 Premium Orange Liqueur. I’m guessing it has some kind of corporate tie to Hornitos but, for all I know, it might actually be even better that way. Still, it worked just fine with the el-cheapo DeKuyper triple sec I happened to have here at el casa de DOTW and might work well with whatever premium or cheap orangey liqueurs you happen to have on hand. I almost hate to suggest it, but the seize your margarita might even be okay with non-Hornitos brands of blanco tequila. The other major alteration I made is the possible use of a teaspoon full of sugar. I got the idea because my watermelon wasn’t as sweet as I’d have liked. Even so, I was more than happy with my first version but I correctly guessed that I could be made happier still with a bit more sweetness. In fact, I wouldn’t necessarily be opposed to adding the sugar with somewhat sweeter watermelon chunks. What’s 16 calories among friends? When you come right down to it, when you throw tequila, watermelon and jalapenos together, it’s kind of hard to go too terribly wrong. The balance of sweet and hot is one I’ve always found hard to resist. Indeed, I have yet to meet a jalapeno margarita I didn’t like, and that includes a beverage full of the usually hated sour mixes and what not that I actually enjoyed recently at the Mexican-style bar at the Orleans Hotel in Las Vegas. Still, the Seize Your Margarita is definitely much, much better than that prefab jalapeno margarita — and good for you too, what with all scurvy-fighting fresh fruit and vegetable extractions mixing with the health-giving power of tequila. In fact, if you’re feeling a bit of a post-fireworks let down this cinco de Julio, give it a try. The French 75 does not refer to the number of pounds Gerard Depardieu could stand to lose. No, it refers to a really marvelous and relatively simple classic presumably imbibed in massive quantities by Ernest, F. Scott, Pablo, Gertrude and all those other people Woody Allen fantasizes about hanging out with. The drink itself is named after a rapid firing cannon, the first truly modern piece of field artillery, say the Wikipedians. 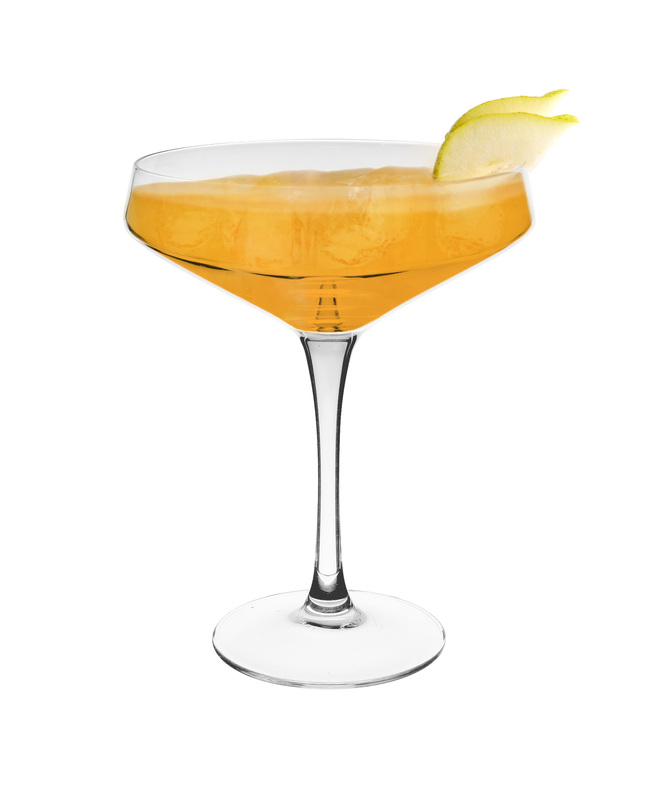 As for the cocktail, it “hits with remarkable precision” according to The Savoy Cocktail Book. I have to say I agree. 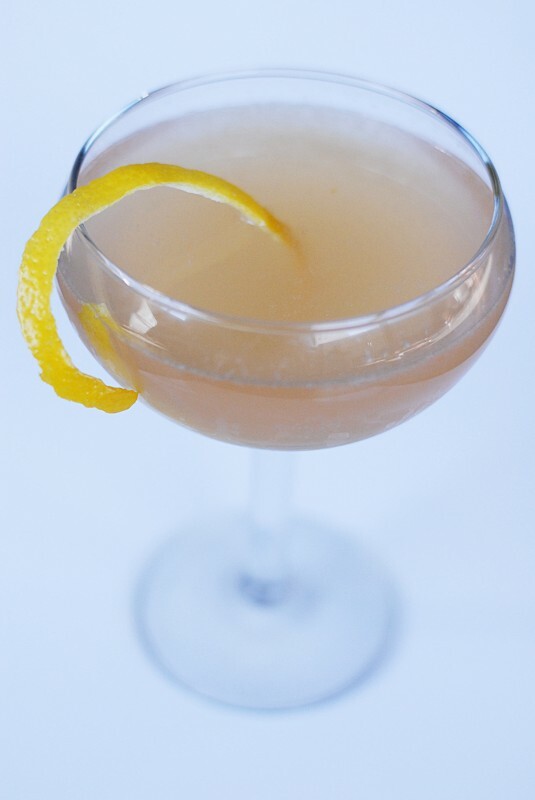 Reportedly created circa 1915 at Harry’s New York Bar in Paris by Harry himself, the French 75 rarely misfires. It’s delicate, friendly, and sophisticated all at the same time. The Lost Generation sure could find their way to a good mixed drink. Combine the gin, juice, and sugar or syrup in a cocktail shaker with plenty of ice. Shake vigorously and pour into a champagne glass. Top off with roughly 2-3 ounces of the dry sparkling white wine of your choice. Add your lemon twist and toast the early/mid 20th century author, poet, or painter of your choice. First of all, I should add that this week’s drink represents a return engagement for the Yellow Tail Sparkling White Wine featured in last week’s beverage, the Capone. I am not a wasteful cocktail blogger and, as I still had half a bottle of not precisely champagne left and those little stoppers things actually work okay, I decided to try another sparkling white wine based cocktail. And, while I admit that Australia is a very long way from the Champagne region of France, any brut (dry) white fizzy wine should work okay here. The Yellow Tail worked pretty brilliantly, in fact, and I feel no need to rename this version of the drink after something Australian. 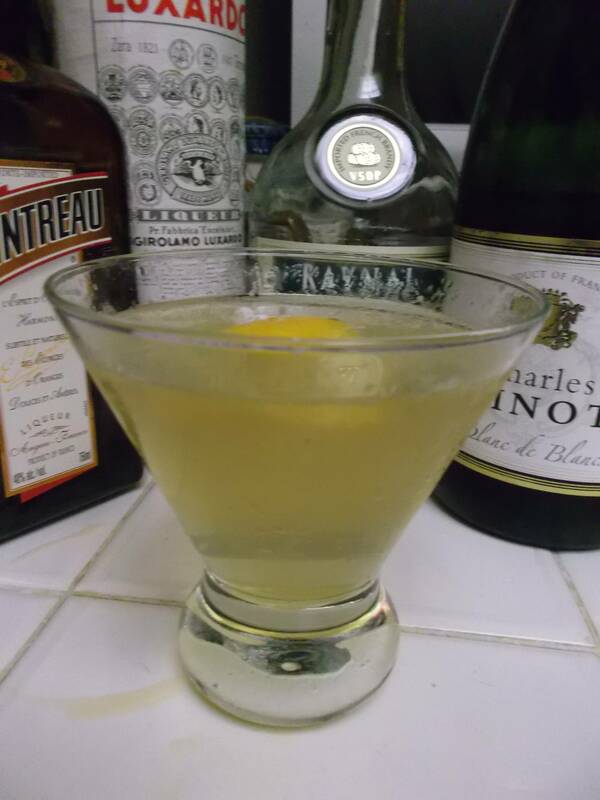 The French 75 is one of those drinks where there is a great deal of variation from recipe to recipe and experimentation is welcome. 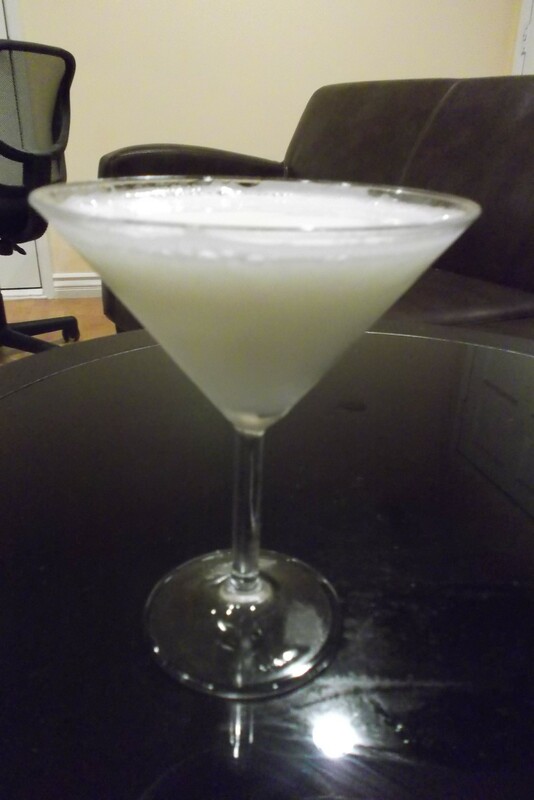 My favorite version of the drink was the one featured above, but I also enjoyed a couple of variations I tried out. One, maligned somewhat elsewhere, used Cointreau in place of sugar for a somewhat boozier, orangey-er concoction; it wasn’t quite as deliciously delicate as the version above, but was still a very nice drink of its own that many may prefer. I also experimented with dispensing with the sugar and using sweetened Hayman’s Old Tom Gin in place of my Beefeater. The result was drier but still very, very light and enjoyable.